Front row, from left: Tyler Misla; Drew Jrolf; Mac Jorgensen; Riley Linne; Jeremy Galen; Max Alexander; George Coulson; Noah Andis; Adrian Malave. On the back row, all seniors from left: Kyle Knee; Zach Hawkins; Cameron Vigh; Ben Migliarese; Adam Hunt; Ty Correa; Dillon Besnier; Matt Masse; Andrew Martinez; and Brendan Herrick. 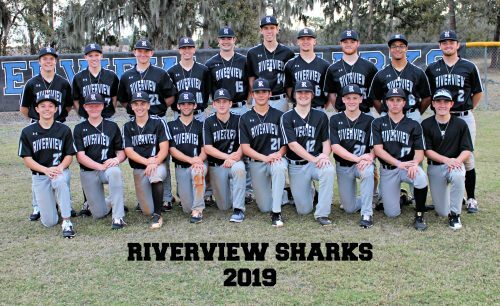 Riverview High was bumped out of the Saladino Baseball Tourney in the quarter finals last week by the eventual champion Plant City. The Sharks’ Dylan Besnier was named to the All Tournament team. The Sharks opened the 2019 tournament on March 16 with a victory over the Gaither Cowboys 6-4. The Sharks were led by Ty Correa on the mound. He struck out 6 and gave up 2 hits in six innings. Tyler Misla came in the 7th to secure the victory. Besnier had a 2-run homer and a double, and ended the game with 3 RBIs. Correa also had a double with 2 RBIs. Matt Masse, Jeremy Galen, Ben Migilarese and Cameron Vigh each had hits. On Monday, March 18, the Sharks played Freedom High School. A close game became a blowout with Sharks winning 14-4. Trailing 4-2, the Sharks brought in senior pitcher Kyle Knees. He pitched 5 scoreless innings and only gave up 2 hits. Because of Knees’ efforts the Sharks were able to add 12 runs to the scoreboard. Macalister Jorgenson, Correa, Adam Hunt, Brendan Herrick and Andrew Jrolf each had 2 hits. Vigh, Migliarese and Zach Hawkins each had hits. The Sharks played the Tampa Bay Tech Titans in the final game of the pool on March 20. Max Alexander and Noah Andis combined to shut out the Titans on only 2 hits. The Sharks dominated the Titans 16-0. Masse had 3 hits. Jrolf had 2 hits. Jorgenson, Galen, Correa, Hunt, Herrick, Migliarese, Vigh and Riley Linne each had a hit. Besnier hit his second home run of the tournament with a 400 foot blast over the center field fence . On March 21 the Sharks played in the quarterfinals of the Saladino Tournament for the sixth consecutive year. The Sharks fell to Plant City in the bottom of the 7th, 4-3. Herrick, with flu-like symptoms, threw 5 innings and gave up 2 unearned runs striking out 9 and only gave up 2 hits. The Sharks had hits from Jorgenson, Galen, Besnier and Masse. Vigh hit a crucial double, while Migliarese and Herrick had hits that led to runs batted in. Riverview’s overall record is 7-3 heading into a big district game March 26.